Gary Wurtz has been the trumpet professor at Stephen F. Austin State University since the fall of 1992, where he also directs the top Jazz Band. His other duties at SFA have included serving as the Assistant Director for Undergraduate Studies of the School of Music, directing the Trumpet Ensemble, performing in the Pineywoods Brass Quintet and serving as Director of the esteemed SFA Summer Band Camps. His many students have gone on to positions as band directors, military bandsmen, professional and amateur performers, college professors, church music ministers and even accountants. He has served the university as chair of the Faculty Senate as well as a member of numerous other committees, including the Strategic Planning Committee, Academic Admissions Standards Committee, University Scholarships Committee, Salary Equity Committee, and many others. In 2012 Dr. Wurtz was the recipient of the Teaching Excellence Award for the College of Fine Arts at SFA. 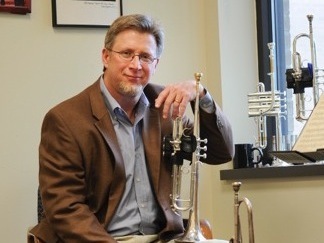 Wurtz came to SFA from the Dallas area where he spent several years as a free-lance trumpeter and private instructor. He held the principal trumpet chair in the Richardson Symphony Orchestra from 1986 to 2001, taking a year off in 1989-1990 to play co-principal chair in La Orquesta Filarmónica de la UNAM in Mexico City and as principal trumpet in the National Orchestra of the Dominican Republic in Santo Domingo. At home in Nacogdoches, he has performed as principal trumpet in the Orchestra of the Pines, with whom he has been featured on the Brandenburg Concerto No. 2 by J.S. Bach (twice), Aaron Copland’s Quiet City, Concerto in Re by Johann Friedrich Fasch and Concerto for Trumpet by Alexander Arutunian. Wurtz has worked extensively as an orchestral musician, jazz musician, soloist and studio musician. He appears frequently as a soloist and clinician, both in the classical and jazz fields, at colleges, high schools and with professional organizations. A native of Alamogordo, New Mexico, Wurtz holds a Bachelor of Music Education from West Texas A&M University (1985), Master of Music Education from the University of North Texas (1987) and the Doctor of Musical Arts in Trumpet Performance from the University of North Texas (2001). His primary teachers have included Dr. Leonard Candelaria, Bert Truax, David Ritter and Art Holt. Wurtz has been married to his wife, Mindy, since 1987. They have two beautiful children, a son, Gage, and a daughter, Hannah. Gary Wurtz is or has been affiliated with the International Trumpet Guild, Texas Music Educators Association, American Federation of Musicians, Pi Kappa Lambda, Kappa Kappa Psi, and Phi Mu Alpha Sinfonia. Gary Wurtz is available as a clinician, adjudicator and performer, and is an artist clinician for Schilke Trumpets.